Varicose veins treatment isn’t performed for aesthetic reasons alone. Varicose veins can cause serious health problems including blood clots, skin breakdown and ulcers, venous eczema and even skin cancers on the rare occasion. About Face Brisbane’s pain-free, non-invasive varicose veins treatment, called sclerotherapy, will give you back the confidence to wear shorts and bikinis again, and will also improve your overall health. 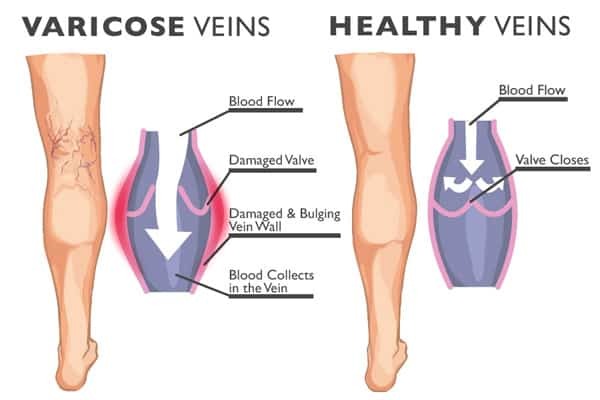 On this page, you’ll find everything you need to know about what varicose veins really are, what causes them, how About Face Brisbane can remove varicose veins, and some tips on preventing them in the first place (and how to stop current ones from getting worse). If you would like to get rid of spider veins, please visit our spider vein removal page. Varicose veins treatment – what are varicose veins? Varicose veins are a common vascular disease affecting around twenty-five percent of adults. Women are more likely to suffer from varicose veins than men. The upper and lower legs are the most common place people develop varicose veins. Varicose veins – very visible, irregularly shaped veins that are enlarged and over-filled with blood. They usually appear raised and swollen and can have a red or bluish-purple colour. Some people with varicose veins experience pain (this is common), a burning or itching sensation, and aches over and/or around the misshapen veins. In severe varicose vein cases, the veins can lead to the formation of ulcers as a result of bleeding. Restless legs can also be caused by varicose veins. Varicose veins treatments – what causes varicose veins? Arteries transport blood from your heart to the rest of the body. Veins, which have elastic walls, transport blood from the rest of the body back to the heart. In order to return the blood to the heart, leg veins need to work against gravity. Lower-leg muscle contractions ‘pump’ the blood back in the direction of the heart and tiny valves within the veins open as the blood flows back to the heart, and then close to stop blood from flowing back down into the legs. These valves are found every few inches along the vein. Valve failure in the veins results in the formation of varicose veins. In the case of varicose veins, because of faulty valves, most of the blood is flowing back down the leg instead of returning to the heart. Age is a contributing factor to this vein failure because as people get older, veins tend to lose elasticity, which causes them to stretch. This can make the valve veins weak, and this loss of strength means that blood that should be flowing back to the heart is allowed to move the wrong way. As a result, blood pools in the veins, and the veins enlarge – they become varicose. Varicose veins are often blue in colour because the pooled blood is deoxygenated as a result of not being pumped through the lungs. Sometimes women develop varicose veins as a result of pregnancy. This is because pregnancy decreases blood flow from the legs to the pelvis, but increases the amount of blood in the body. This change in blood circulation is necessary to support the developing foetus but can cause the unfortunate side effect of varicose veins. It is common for varicose veins to appear for the first time, or get worse, during late pregnancy as the foetus puts greater pressure on leg veins. Changing hormones during pregnancy may also contribute. The good news is that if varicose veins develop during pregnancy in women who didn’t have varicose veins previously, the veins are likely to go away by themselves within three to twelve months of giving birth. How can About Face Brisbane get rid of my varicose veins? About Face Brisbane offers the most effective varicose veins treatment, called sclerotherapy. Dr Colin Campey, the lead doctor for About Face Brisbane, has been treating varicose veins (and spider veins) with both sclerotherapy and laser therapy for around twenty years with an extremely high success rate and a perfect safety record. How does sclerotherapy for varicose veins treatment work? Sclerotherapy (sometimes called compression sclerotherapy) involves a series of treatments with painless injections into the varicose vein, using a solution that closes the vein. The in-clinic treatment is followed by several weeks of wearing compression (support) stockings which must be medical grade. The diagram below provides a simple explanation of how sclerotherapy works. What is involved in varicose veins treatment (compression sclerotherapy)? You’ll have an initial with Dr Campey, who will look at your varicose veins, perform an ultrasound and provide you with advice regarding how the treatment works, how many treatments you will need and discuss the importance of wearing compression stockings to achieve optimal results. This consultation is $100 with a rebate from Medicare of approximately $90. After this consultation, you can book an appointment to have the treatment at a follow-up time. Sometimes you may want to wait until the cooler months to commence your treatments, as wearing stockings in the middle of summer isn’t ideal. For the treatment, you’ll lie on your back on a comfortable table in a private room in our North Lakes clinic with your legs elevated slightly. Dr Campey will use a thin needle to carefully and slowly inject a solution into the varicose vein. After Dr Campey has withdrawn the needle, he will apply compression. The total number of injections you’ll need will be influenced by the quantity and size of the varicose veins you have. There is no downtime after varicose veins treatment, so you can move and walk around as normal after the procedure and get back to your normal daily routine right away. Wearing Stockings (medical grade). We sell Sigvaris Medial stockings, the best compression stockings available in Australia, for $99 each (i.e. stockings are sold singularly as many people will only need to wear one). help the body to seal off the injected veins. You must walk for at least 30 minutes right after your treatment session. For the weeks following treatment, you must walk for thirty minutes or more each day. This is very important as it will reduce complications (such as the risk of blood clots) through improving blood circulation to the treated leg or other body parts. Walking will also ensure a good result is achieved. Follow up visits with Dr Campey will be discussed at time of treatments. As a precaution, you should also avoid strenuous exercises for two weeks after your treatment. All of this will be explained to you by Dr Campey in your initial consultation, and he’ll remind you again after your treatment. What are varicose veins treatment prices? One sclerotherapy session costs $350. Taking advantage of zipPay for varicose veins treatment means you can get the medical help you need now, but pay later (note – we are not affiliated with zipMoney so, therefore, can’t accept zipMoney payments). Medicare rebates are available for this treatment. We sell compression stockings (medical grade by Sigvaris Medical) at our clinic for $99 each. Without treatment, varicose veins continue to get worse for the vast majority of people, so call or email us today to start your journey towards saying goodbye to your varicose veins. How many treatments will I need to get rid of my varicose veins? Most people require two or three compression sclerotherapy treatments to completely get rid of varicose veins. The best way to find out how many treatment sessions you are likely to need is to visit our North Lakes clinic for a consultation with Dr Campey. You will need to wait for 1-2 weeks in between treatments. What are the side effects of sclerotherapy treatment? In the weeks following treatment, the treated veins may appear slightly darker. This is a normal process of the vein coagulation and will fade over a period of weeks. Sclerotherapy is safe and effective without long-term side-effects. Warning: your wallet may hurt as you might want to buy new clothes to show off your vein-free skin! When the tiny needle is inserted by Dr Campey into the varicose vein, there is a very small sting but sometimes you won’t even feel the needle. No anaesthetic is required for this treatment. Is sclerotherapy the only option to get rid of varicose veins? In some cases, the other option is ultrasound-guided endo-vascular laser therapy where an optical fibre is inserted into the vein and laser energy is fired into it. This has a similar success rate to compression sclerotherapy. Sclerotherapy and laser therapy aren’t the only options to get rid of varicose veins – but they are the best. Before sclerotherapy and laser therapy became available as treatment options, doctors used to remove varicose veins through surgery. This surgery, called vein ligation or vein stripping, involves complete removal of the vein via excisions in the skin under anaesthesia. Next, the vein was cut and pulled out, hence the term ‘stripping.’ If just reading about varicose vein surgery makes you cringe a little, there is a good reason for that – it is an invasive, aggressive option that is rarely used now as the medical science advances that make sclerotherapy and laser vein therapy possible mean that in the vast majority of cases, vein surgery is simply not needed. How can I prevent varicose veins from forming? Exercise regularly – this will improve blood circulation. Maintain a healthy weight range, which means that some people will need to lose weight. Don’t wear high heels on a regular basis. Although heels look great, wearing them stops larger veins from functioning properly. Avoiding standing for long periods of time. If you currently have varicose veins, follow the suggestions above, and also elevate your legs whenever you’re sleeping or lying down, as this will help blood to drain in the right direction (to the heart). Unfortunately, however even if you follow these suggestions very carefully, once varicose veins have formed, for most people they get worse as time goes by. The best way to treat your varicose veins is to have them treated in our clinic. Call our friendly staff today on (07) 3482 2999 to find out more or make a time to come and see us.